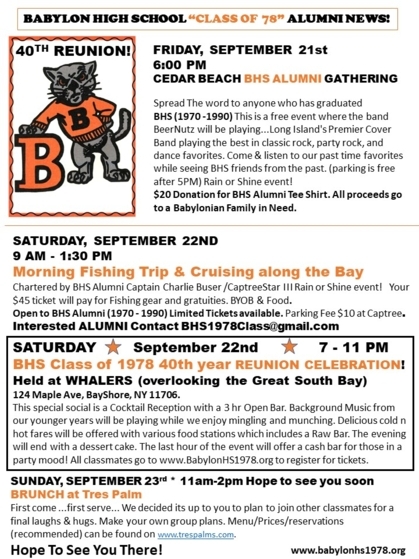 The CedarBeach BHS Annual Alumni Reunion wants to help a Babylonian Family in Need by offering BHS Alumni Tee Shirts asking a $20 donation.Pick up Tee at the alumni event 9/21/18. I heard the Fishing trip is on !!! - that means several of us who want to body surf and fish may need to leave the Saturday morning body surfing event a little early to start throwing Killies overboard around the Great South Bay starting at 9 am on Saturday. Again, don't despair - the Saturday am body surfing competition is still on, just going to move up the start time to 730 am. That we can do some sunrise yoga on the beach - Isis Isis ra ra ra ra!. ( Mark H is leading the yoga and Mike J is leading the chants - should be good). Also, the true beauty of this competition is that you may arrive late and self report your excellence; or you don't even have to show up at all if you really really don't want to. You can just lie, puff, make stuff up, or just totally blovate at the Sunday brunch about that perfect wave you rode in 1978 and still win this very casual event. Of course submitting cropped photos of yourself on the body of a 18 year old body surfer with an actual six pack will only help your cause. Or you could just bring a frisbee ...? Potential grand prizes for best body surfer include: a package of Wisconsin Cheese Curds, a left over Charleston chew from 1977 Babylon Baseball team bus, a crown or tiara; and/or the speedo of shame. Danny Lynch told me he was shooting for the extra sleek black speedo but really what do expect from a Navy pilot. Your choice. Good luck! It is time to order your tickets for all our REUNION activities. Just click above 40th Class Reunion menu button for information about each activity. Signed up for the reunion!! Looking forward to seeing all of you. Coming in from Michigan and I'll be coming to the beach, the reunion, and the brunch. I won't be coming to the fishing trip because I'll be spending time with my father, who I don't get to see that often. Thank you for joining our class registry. This will be our site of our REUNION updates and surveys etc. To learn about any plans of getting together... All you have to do is complete your profile by clicking your name and you'll have access to the entire website venues! It is so easy. If your name is not on our registry and you want to join please contact us and your name will be added to our profile list. MEMORIES OF FRIENDS: Please find the time to send a memory about our classmates that are no longer with us. Just go to classmate profile and click on any classmate with *** following their name. 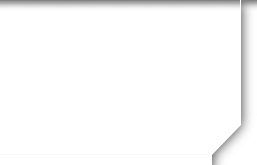 You can type in a response there. Thank you! We can always use your help...Once you are logged in look at: Missing classmates Click on classmates you may be in contact with. Since they haven't registered as yet please fill in any email info or contact us with any other kind of info that maybe helpful in finding someone. Our goal is to contact everyone in our class! PASS THE WORD!